Urinals with Lips! – WTF!? I’m in Florence, Italy and the people in the hostel run by Mike Tyson (read “Does a Serial Killer Live Here?” article) decided to go out to the clubs for a few drinks. First off, they are soooo expensive – have your drinks beforehand. 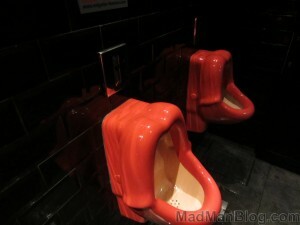 And second, this one particular club has the craziest urinals I have ever seen.